The Greenland/Iceland Pink-footed Goose population winters almost exclusively in Britain. This population breeds primarily in central Iceland with smaller numbers also occurring along the east coast of Greenland. There is also a smaller population of Pink-footed Goose which breeds in Svalbard and winters in the Low Countries (the Netherlands, Belgium, Luxembourg and, increasingly, Denmark). The Goose & Swan Monitoring Programme only monitors the Greenland / Iceland population. Generally varied between 17% and 23% between 2004 and 2014. Annual census-derived estimates of the population size, percentage of young (%) and mean brood size (young per successful pair) of Greenland/Iceland Pink-footed Goose, 2003-2017. Data collected through the Icelandic-breeding Goose Census. Greenland/Iceland Pink-footed Geese breed primarily in central Iceland and in smaller numbers along the east coast of Greenland. Many thousands of non-breeding birds migrate from Iceland to northeast Greenland to moult. 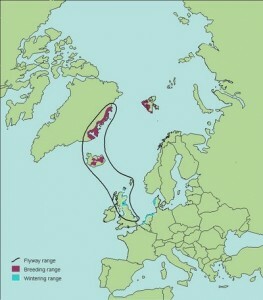 Migration begins in early autumn to the wintering grounds, which are almost entirely in Britain. Very small numbers also occur in Ireland. From mid April, birds begin to leave Britain and stop over in southern Iceland before departing for the breeding grounds, where they arrive from mid May (Mitchell & Hearn 2004). Arrival in Britain begins in September particularly in northeast Scotland, at places such as Loch of Strathbeg, Aberdeenshire, and there is rapid movement further south as far as Lancashire. As winter progresses many of the birds in east central Scotland move south to England. 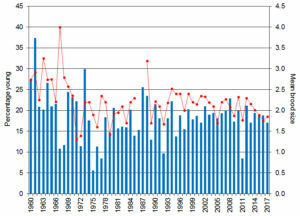 Numbers in the southernmost wintering area of Norfolk have increased considerably since the early 1990s, and now up to half of the population occurs there in mid winter. The traditional main winter habitat is thought to have been saltmarsh, but from the late 19th century the species has moved inland to feed on farmland. In recent decades birds have fed on valuable agricultural crops, such as fertilised grassland and cereals, and have been frequently accused of reducing crop yields and puddling soils. In autumn when they feed on fields containing post-harvest root crops, such as potatoes and waste sugar beet, they do no harm, but during mid winter and spring they graze on growing cereals and come into direct competition with livestock for the spring growth of grass leys. Local feeding studies have demonstrated seasonal changes in the diet of Pink-footed Geese apparently responding to, and in part driven by, seasonal changes in the habitats available. Mitchell, C. & R.D. Hearn. 2004. Pink-footed Goose Anser brachyrhynchus (Greenland/Iceland population) in Britain and Ireland 1960/61 – 1999/2000. Waterbird Review Series, The Wildfowl & Wetlands Trust/Joint Nature Conservation Committee, Slimbridge. The Greenland/Iceland Pink-footed Goose population is monitored through the Icelandic-breeding Goose Census; an international census undertaken in Britain, Ireland, Iceland, Norway and the Faeroe Islands. The census is undertaken annually and involves coordinated counts carried out in autumn and early winter. Results from the census are presented in annual reports, which can be downloaded from the Reports & newsletter page. The annual breeding success of the Greenland/Iceland Pink-footed Goose population is monitored through age assessments that are undertaken annually throughout the autumn and early winter. Counters record the number of first winter birds present within a flock and individual brood sizes (i.e. how many young in each family group). The 58th consecutive Icelandic-breeding Goose Census took place during autumn and winter 2017, providing information on the abundance and distribution of Greenland/Iceland Pink-footed Geese. A full account of the census can be found in Brides et al. (2018). Counts were conducted by a network of volunteer observers and professional conservation staff over the weekends of 21/22 October and 18/19 November 2017. An additional early spring count was conducted over the weekend of 10/11 March 2018 in order to assess distribution at this time of year (see Brides et al. (2018)). Coverage in the UK was good, with 98 sites visited in October and 106 in November. Outside the UK, counts were made at several sites in Iceland during October, when some birds had not yet left breeding areas. Totals of 515,852 and 376,798 Pink-footed Geese were counted in October and November, respectively (Table 1). The total numbers counted in these months were 7.2% and 3.6% higher than the respective unadjusted counts in the previous year. Coverage was good, and no estimated counts needed to be added to the total. The peak winter total in October was used to derive a population estimate of 515,852 geese. This represents an increase of 7.2% on the previous year (Figure 1). During the October census, 15 sites held over 10,000 Pink-footed Geese. The highest numbers were recorded at Montrose Basin, Angus which held 80,000 birds (15.5% of the population estimate), Morecambe Bay, Southwest Lancashire (38,600, 7.5%), Beauly Firth, Highland (29,500, 5.7%), WWT Martin Mere, Southwest Lancashire (25,000, 4.8%), West Water Reservoir, Borders (20,150, 3.9%), Carsebreck and Rhynd Lochs, Perth and Kinross (19,500, 3.8%), Whitton Sands, Humber (18,100, 3.5%), Findhorn, Moray (16,130, 3.1%) and Loch of Skene, Aberdeenshire (16,000, 3.1%). Combined counts from the 27 sites holding numbers exceeding 1% of the population estimate (5,158 birds) accounted for 82.9% of the total October count. Table 1. Regional distribution of Pink-footed Geese during October and November 2017 (nc = not counted, or no count received). Figure 1. Annual census-derived estimates of Pink-footed Goose population size, 1960–2017. Five year running mean shown as red line (e.g. mean for 2014 is from population estimates for 2012–2016). Between early October and late November, a total of 24,590 Pink-footed Geese, in 34 flocks, was aged at various locations throughout Scotland and England. This sample represents 4.8% of the 2017/18 census-derived population estimate. The brood size of 448 families was also determined during this period. Breeding success was similar to the mean for the previous decade, with 17.1% young recorded (mean 2007–2016: 18.4% ± 1.2 SE) (Figure 1). The mean brood size of successful pairs was 1.85 young, which was lower than the mean recorded during the previous ten years (mean 2007–2016: 2.05 ± 0.06 SE). Table 2. The percentage of young and mean brood size of Pink-footed Geese in autumn 2017. Figure 2. 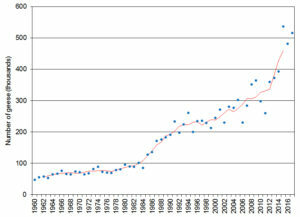 The percentage of young (blue columns) and mean brood size (red circles) of Pink-footed Geese, 1960/61–2017/18. The 2017 population estimate of 515,852 was 7.2% higher than the previous population estimate of October 2016 (481,341 birds) and is the second highest population estimate ever recorded, with the highest being when the population passed half a million birds in October 2015 (536,871). The breeding success of Pink-footed Geese in 2017, at 17.1% young was slightly lower than the previous year (18.8%) and lower than the previous ten-year mean of 18.4% (± 1.22 SE). Recent research through the GPS tracking of individual Pink-footed Geese has highlighted the possibility that new roosts are being used during the autumn. Thus, the information gathered will be used to identify any new sites that require covering as part of the Icelandic-breeding Goose Census. In the 1950s, WWT initiated a study into the population dynamics of Pink-footed Geese. The first capture was of seven in southwest Scotland on 22 March 1950, and the following winter a further 686 were marked. By the end of the decade, some 11,844 had been newly ringed in northern Britain. Two expeditions to the breeding grounds in central Iceland caught 1,151 flightless Pink-footed Geese in 1951 and a remarkable 8,745 in 1953. The geese were marked with metal rings only but generated many recoveries with rings being returned by wildfowlers. A second phase of marking began in the late 1980s, with renewed interest in the fortunes of this population as numbers were increasing. The birds were marked in wintering areas, primarily WWT Martin Mere and Loch Leven, with either engraved plastic leg rings or neck collars. The highest number caught was 348 in 1988 and between 1987 and 2016, a total of 3,345 had been marked. A further 41 birds were caught in Iceland in July 1987. Then, between 1996 and 2000, WWT joined colleagues from the Icelandic Institute of Natural History to capture geese on their breeding grounds in north and central Iceland. This resulted in a further 3,246 newly ringed birds, the vast majority of which were fitted with neck collars. In recent years, captures have been much reduced but have continued in Britain thanks to efforts by the Tay Ringing Group and the Grampain Ringing Group. During the winter, Pink-footed Geese are usually caught using large nets fired over grazing flocks; these were initially powered by rockets, but since the 1980s, cannons have been used. During the summer months on the breeding quarters, goslings are growing their first flight feathers and the adult birds become flightless whilst moulting and replacing their flight feathers. It is, therefore, possible to round up the flightless geese (rather like rounding up sheep) into netted corrals. In total, more than 65,000 sightings of colour-marked birds have been made since the late 1980s. These individually-marked birds, some of which have been seen more than 50 times throughout their lifetime, have allowed a detailed understanding of the individual pairing and breeding success, survival rates and site selection. This information, along with other demographic data from the Goose & Swan Monitoring Programme, has been used to explain changes in population size and distribution (e.g. Frederiksen et al. 2004). Resightings of colour-marked Pink-footed Geese have led to a number of important discoveries concerning their movements and individual use of the flyway. This work has confirmed that the geese migrate from breeding grounds in Greenland and Iceland, staging at important sites in east Scotland before perhaps up to a half of the population migrate south to Lancashire and Norfolk, though there is almost certainly also some direct arrival into Lancashire. 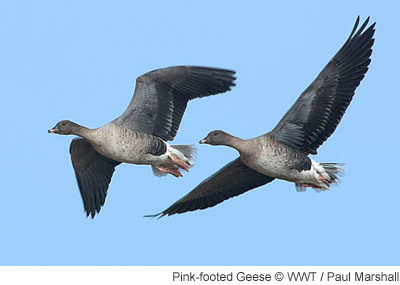 Hunting in Iceland: The numbers of Pink-footed Geese hunted in Iceland are available here.